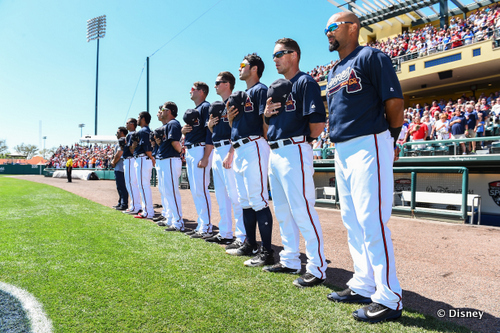 You can experience the magic of spring training at Disney for one final year with the Atlanta Braves. Festivities include character appearances and special moments including kids running the bases and other in-game entertainment that have made Braves Spring Training at Disney a grand slam year after year. Monday, February 25, 2019 vs. Washington Nationals at 1:05 p.m.
Tuesday, February 26, 2019 vs. New York Mets at 1:05 p.m.
Thursday, February 28, 2019 vs. Detroit Tigers at 1:05 p.m.
Friday, March 1, 2019 vs. Toronto Blue Jays at 1:05 p.m.
Sunday, March 3, 2019 vs. Miami Marlins at 1:05 p.m.
Monday March 4, 2019 vs. Houston Astros at 1:05 p.m.
Wednesday, March 6, 2019 vs. Detroit Tigers (ss) at 1:05 p.m.
Friday, March 8, 2019 vs. Philadelphia Phillies at 6:05 p.m.
Monday, March 11, 2019 vs. Pittsburgh Pirates at 1:05 p.m.
Tuesday, March 12, 2019 vs. St. Louis Cardinals at 1:05 p.m.
Friday, March 15, 2019 vs. Miami Marlins at 1:05 p.m.
Sunday, March 17, 2019 vs. Houston Astros (ss) at 1:05 p.m.
Monday, March 18, 2019 vs. New York Yankees at 6:05 p.m.
Tuesday, March 19, 2019 vs. Washington Nationals at 1:05 p.m.
Friday, March 22, 2019 vs. Detroit Tigers at 6:05 p.m.
Saturday, March 23, 2019 vs. New York Mets at 1:05 p.m.
Tickets go on sale November 19, 2018 and are available through the Atlanta Braves' website (braves.com/springtraining), ESPN Wide World of Sports box office and through Ticketmaster (1-800-745-3000).